Canton, 0 @ King Philip, 9 – Final – Junior Jeremy Rhines tossed a complete game shutout to earn the win for the Warriors. Rhines allowed just three hits while striking out nine batters. The Warriors’ offense came to life with 12 hits. Will Weir, Patrick Limerick, Ryan Coulter, and David Morganelli each had multiple hits. Franklin, 2 @ Taunton, 5 – Final – Taunton jumped out to an early lead, scoring four runs in the first inning and never looked back. The Tigers added another run in the fourth inning. 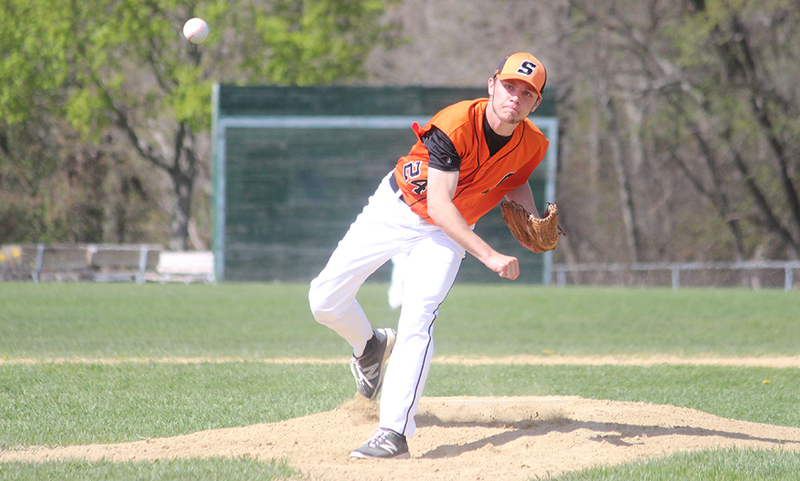 Sophomore Jack Moynihan tossed a complete game, striking out six without issuing a single walk. He allowed seven hits with just one earned run. At the plate, Moynihan went 2-for-3 with an RBI while Matt Machado added two hits, Joe Manchester had a double and an RBI and Christian Simoes hit a home run. King Philip, 6 @ Canton, 0 – Final – King Philip sophomore Faith Turnese tossed a complete game shutout in her varsity debut, allowing just two hits while striking out six batters. Meghan Gorman had three hits for the Warriors, including a two-run home run. Jess Bonner added a two-run double for King Philip. Stoughton, 17 vs. Brockton, 6 – Final – Gina Carafa took over in the circle in the fourth inning with the Black Knights trailing 6-4 and held Brockton scoreless over four innings of work with nine strikeouts. She also drove in what turned out to be the game-winning run with a triple. Jordan Lyons went 2-for-2 with three runs scored and three RBI. Nikki Coppola, Shannon Flaherty, Taylor Levine, and Carafa all had multi-hit games for Stoughton. Taunton, 4 @ Foxboro, 17 – Final – Lauren Flahive led the way for Foxboro with four goals, while Caroline Boudreau and Meghan Curran each had hat tricks. Foxboro got goals from nine different players. Delaney Powell scored a pair of goals for the Tigers, while Abbey Kingman and Alana Tavares each had one. Taunton, 71 @ Mansfield, 65 – Final – For Mansfield, sophomore Alexis Kiyanda ran amn outdoor PR in the 200, taking 2.5 seconds off to run a 26.8. Junior Madison Haughey won the high jump and qualified for states with a jump of 5-1 and also placed second in the hurdles. Junior Sophia Madonna won the discus while senior Julie Romano won the two mile. Mansfield also won the 4×100 relay (Olivia Horn, Julia Harrison, Angela Corkery, Amanda Mangano) and the 4×400 relay (Caitlin Whitman, Mikaela Maughn, Cassidy McMahon, Emma Oldow). WRENTHAM, Mass. – Defense wins championships and that was the mentality of the King Philip Warriors on Thursday afternoon as they hosted a talented Bishop Feehan team. 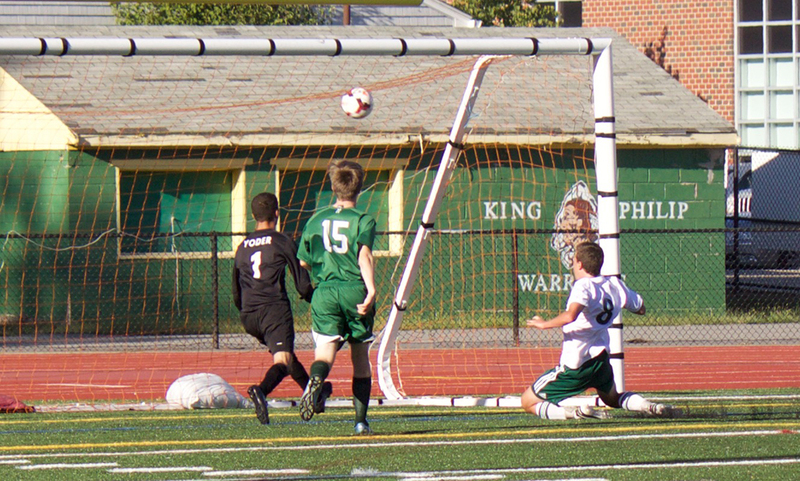 In the end, the defense and Zac White’s second half goal were the big reasons King Philip came away with a 1-0 win over the Shamrocks. The Shamrocks came out fast and aggressive and looked for their offense very quickly. They attacked the ball and tried to exploit the cracks in the defense, but King Philip did the job in closing those gaps and playing good team defense. KP head coach Nick Gale noticed his defense’s hard work and had nothing but praise for them. “It was one of their best games, the back four played amazing,” Gale said. The back four, made up of Cam Mullins, Ryan Coulter, Larsen Keys, and Jack Bush, proved why they are one of the strongest defenses in the Hockomock. Although they did allow ten shots on goal, they were able to minimize and shut down many of the opposition’s attacks, with Bush thwarting a handful of Feehan opportunities. Senior Eli O’Neill had a strong game in goal behind the back four. O’Neill, who has only played three varsity games in his career, looked like a veteran in net, stopping 10 shots and influencing a handful more. The Warriors spent most of the game on the defensive side of the ball, but when they advanced it, they took advantage of their opportunities. In the 23rd minute, there was a glimpse of hope followed by a crash of disappointment. Bush fired from about 25 yards out and his shot seemed to be going right over the goalie’s head into the back of the net, but at the very last second, Feehan’s goal rose up and just got a fingertip on it. KP’s offense kept pounding away at the Feehan defense and finally broke through in the 47th minute. The ball bounced around from Warrior to Warrior and ended up at Tony Bozza’s feet in the left corner. 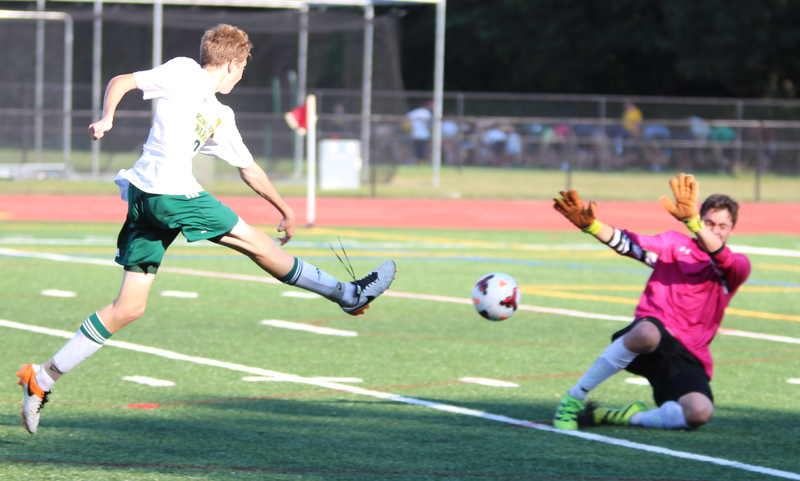 He centered the ball to a wide open White, who tapped it right over the outstretched Bishop Feehan goalie for the sole point of the game. When asked, Gale made it a priority to point out that both Bozza and White are sophomores who have very bright futures and will be able to lead the team in the upcoming years. 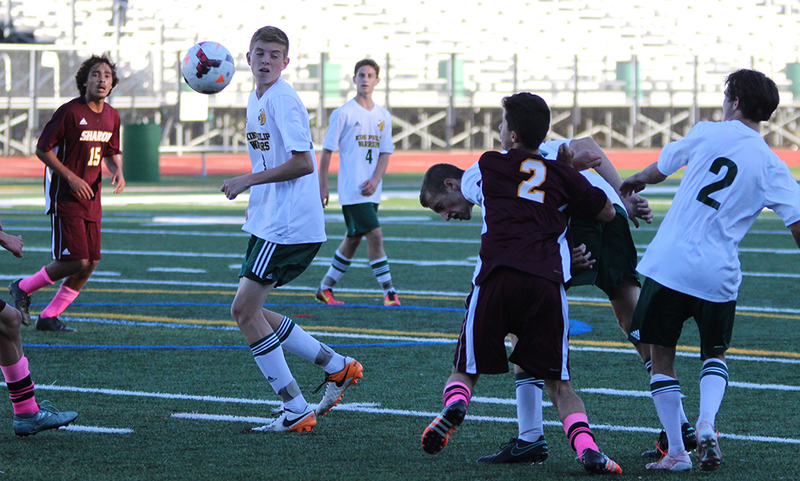 After the King Philip goal, Feehan became even more aggressive on offense and had some late game pushes. The Warrior defense stood strong though and didn’t allow any attacks to get too far. With the win, King Philip improves to 3-0 overall. The Warriors will try to ride this momentum into their next game against Canton on Friday afternoon.